With old mills coming back online and retrofitting existing mills for automation, reliable feedback for precision motor control is critical to improving mill efficiency and process optimization. Encoder applications include controlling infeed line speed, positioning blades for optimal log cuts, speed and position control in debarkers, edgers and veneer peeling lathes and precision control in automated grading machines. The wood processing industry relies on incremental encoders and absolute encoders that can handle high speed and tough environments without failure. 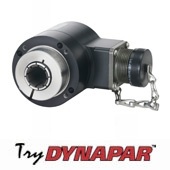 Dynapar meets this requirement offering heavy duty hollow-shaft encoders with unbreakable code discs, rugged encoder designs that withstand up to 400g shock and 20g vibration and IP67 sealing. 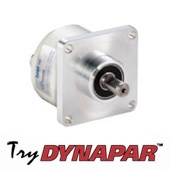 Dynapar encoders offer fast lead times averaging 3 days or less with rush delivery available. The AI25 with SSI interface offers precise absolute position feedback, easy installation, -40°C to 100°C operating temperature range and IP64 or IP67 protection. Available in shaft or hub-shaft mounting styles. The HS35R is an incremental encoder with a mylar unbreakable code disc for heavy duty applications, able to withstand 400g shock and 20g vibration and rated for IP67 applications. Hollowshaft encoder design with customizable mounting options. The HSD25 harsh duty incremental encoder is a rugged, compact encoder with IP67 sealing, unbreakable code disc with up to 3600 PPR and wide temperature range. 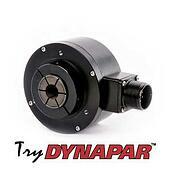 Hubshaft design available in anodized aluminum, stainless steel or nickel plated housing.